Anyone who knows me well enough, knows all too well about my fascination and fandom involving the musician, Jack White. This fascination goes beyond the usual appreciation for his artistry, music, aesthetics or weird and eccentric appeal. I first saw him in 2001 on my TV screen, when I was 14-years-old. He was performing at the MTV Movie Awards. There was something about him that was just so enthralling. The force was strong with him so to speak. He always seemed like a character plucked out of a Tim Burton film. His charisma and eccentricities can pretty much be summed up as being the lovechild of Johnny Depp and Michael Jackson. He evokes that sort of awe and etherealness. His talent is unparalleled compared to most of his contemporaries today. He is one of music’s true survivors over the last 15 years. He lives, breathes and sleeps pure Rock ‘n Roll. This is all due to him remaining true to himself and going with the flow. Going with the flow translates into taking risks, being impulsive and pushing the boundaries of musical frontiers while most musicians find themselves stuck in their comfort zones. He may be prone to getting bad press every now and then for his apparent inflated ego or throwing verbal punches at his fellow contemporaries but who are we to judge? We have all been guilty at some point or the other in our own daily lives of verbal diarrhoea and of not thinking before we speak. Alas, the man is only human, but what he has achieved is otherworldly. 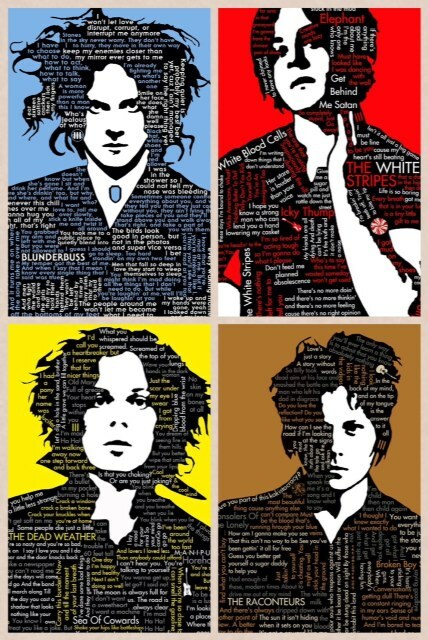 So why exactly do I adore Jack White? The answer is pretty simple… He makes the impossible seem possible. He makes us all believe that any dream; no matter how zany, far-fetched or unattainable it may appear to be at first, can actually be achieved through simple hard work, passion for your craft and keeping your eyes firmly on the prize. Let’s look at what he has achieved…I can proclaim, with irrefutable certainty that he is perhaps the most pivotal figure to bring back the vinyl format to mainstream media. In an age that is technologically-driven, where at the click of a button on your smartphone or PC, you can download music, Mr. White has emphasized the need for all music lovers to fall in love again with the romanticized, tangible format known as vinyl. But, it doesn’t end there! There is a reason why Rolling Stone Magazine labelled him Rock ‘n Roll’s Willy Wonka. We have all read Roald Dahl’s, Charlie and the Chocolate Factory and fell in love with the eccentric yet lovable character of Willy Wonka. Mr. Wonka was the proud owner of a chocolate factory and created every possible outlandish chocolate concoction you can think of. Our real-life Mr. Wonka, Mr. White established Third Man Records (TMR). It first kicked off in the early 2000s as a record label, establishing its headquarters in Nashville, Tennessee moonlighting as both a record store and a record label soon after. From there on, an auditorium was added where live shows can be held. More recently, a novelty lounge was established. He also included the TMR Vault as an offering to his fans to subscribe and purchase limited addition vinyl packages. He then established the Third Man Records Rolling Record Store which in actuality looks like a yellow, ice-cream van that was converted into a mobile vinyl store for vinyl lovers to purchase the latest releases by TMR artists. Two months ago, Mr. White made headlines by creating a new world record by recording, pressing and releasing the world’s fastest vinyl record. This feat was achieved in under four hours. Over and above this first of its kind achievement, he broke many more records involving the vinyl format through the sales of his first and second solo albums. Was that too much to absorb? Does it seem like I’m blowing his trumpet? You’re probably thinking that he has a business and sold a bunch of albums, so what? The ‘what’ that everyone needs to realize about this remarkable being is his tenacity and willingness to push himself further and further into uncharted territories. So whether you want to be a pilot, an astronaut, a Nobel Peace prize winner or a professional rugby player, remember that it’s possible. Jack White has taught us that our dreams are possible, reachable, attainable realities. I recall one of my Facebook friends, a native from Detroit who was fortunate enough to witness The White Stripes perform live for the first time recount his experience. Jack was booed, people viewed them as a joke, people criticized his voice, no one thought that he would make it. Back then, he was an upholsterer. Even though he had his own upholstery business, times were tough financially but he soldiered on; earning a living and making music- his true passion. Again, he has taught me another lesson. When faced with adversity and criticism, channel that negativity to produce positive energy, make your haters your motivators. We should never allow anyone to get the better of us. He has taught me to keep my head high, be comfortable with my strong and weak points and to always be grateful for each step in life that I take. Every step in life is always progressive because we always learn a lesson from each life experience. In conclusion, I want to thank Jack White for the music. His music always has always struck a nerve with me. Whether it’s heartache, grappling with the fact that my dad is an alcoholic, work stress or my usual depressive mood, his music always uplifts me and helps me put life into perspective. I have so so many dreams and aspirations, and thanks to Jack White setting an exemplary example of how to do things, I live with a burning desire to move mountains and achieve something magical! Thank you likewise! I always enjoy sharing my nearly unhealthy love for him with like minds.